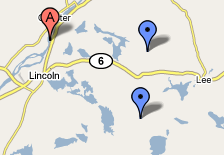 Rollins Wind - The Lincoln Maine Wind Project: Updates? Seems to me that things have quieted down a bit in town regarding the wind project. Did you see the turbines travel through town a few weeks ago? No I don't live near Lincoln but I think horizontal windmill turbine design is giving wind power a bad name, it doesn't deserve, and is more costly alternative; many more smaller vertical wind turbines could provide the 60 Megawatts for far less money than the estimated $130 million for Rollins wind. [I won't charge for this advice.] See windside.com or search "vertical axis wind turbines" in google. 95% of Vinalhaven likes their project which is horizontal but only 3 towers. Are Rollins towers really 400 feet tall? Do they have a permit from FAA? VERTICAL WIND POWER YES ... Horizontal.. not so sure.